Energy production. Price differential. Infrastructure. Market access. If you’re from Alberta, these words probably make you think about oil. But they should also make you think about another type of energy making headlines in Alberta: wind. On Monday, Dec. 17, the Alberta government announced the procurement of over 700 megawatts of wind generation at a weighted average price of 3.9 cents per kilowatt hour — a very low price for electricity and further proof that Alberta has high-quality wind resources and the expertise to develop them at low cost. Yet while this announcement is certainly cause for celebration, Alberta needs to begin thinking about the future as it moves toward its goal of 5,000 additional megawatts of renewable generation capacity by 2030. 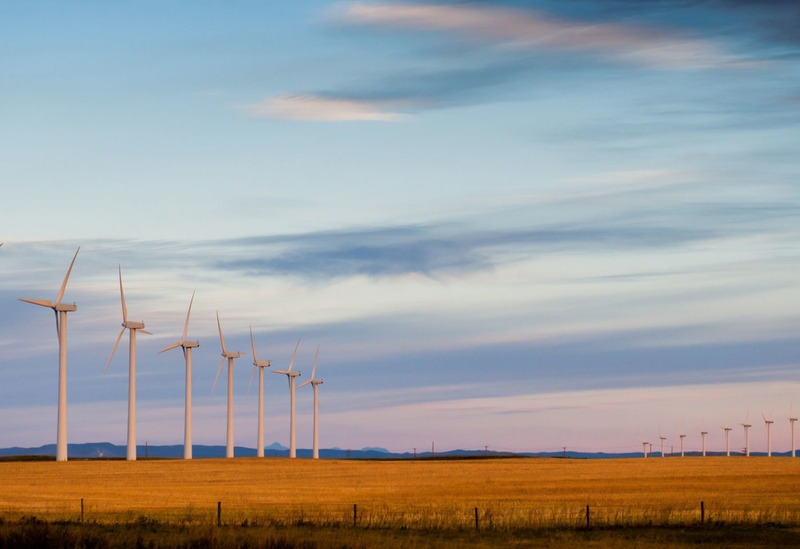 Without a more integrated grid that improves access to neighbouring electricity markets, Alberta’s growing wind resources may face the same problems its oil resources are facing today. Alberta oil is suffering record price discounts because of constrained market access. Alberta is producing more oil than can be efficiently transported to those who want to buy it with existing infrastructure (e.g. pipelines). The result of all this energy getting bottled up in the province? Decreased value. Electricity works the same way. Without the ability to get electricity from where it can be produced to where it can be consumed, it is worthless. With renewable electricity such as wind, the problem is more severe than other commodities because electricity is hard to store, and generation from wind is not controllable. As more wind is added to the grid, it can overtake electricity demand during particularly windy periods. If there is no place else to go and no one else to buy it, the value of the electricity drops, and excess generation must be curtailed — essentially wasting it. Other places are already experiencing this problem. On particularly sunny days in California, so much solar electricity is produced that grid operators must shut some off at times. In response, the state’s largest grid operator has established a market with neighbouring grids to sell excess solar generation. Alberta’s grid is relatively isolated. There are some interconnections with its neighbours, but studies show that more transmission capacity is needed to take full advantage of the prairie’s abundant and cheap wind resources. Alberta knows first-hand what happens when there is not enough infrastructure to get its energy products to those who want to buy them. Improving interprovincial trade is about more than just transmission lines — an argument made in a recent research paper from the Canada West Foundation entitled Power without Borders: Moving towards an integrated Western grid. Buying and selling electricity is a highly regulated business where the rules differ from province to province. For example — right now, Alberta and British Columbia cannot trade electricity via the transmission capacity that currently exists, on timescales smaller than one-hour increments. This constraint can depress the value of wind electricity since it fluctuates by the minute. Rules like this will need to change to enable more valuable electricity trade between the provinces. A more integrated grid will also help Alberta manage the inherent variability of renewable electricity such as wind and solar. Since British Columbia has large amounts of controllable hydroelectric generation, it can ramp electricity production up and down as need be without producing emissions. Better integration means Alberta could benefit from this as well and avoid paying for emitting generators that often sit idle except for when electricity demand is the highest — a handful of times every year. Alberta wind should take some lessons from Alberta oil. It is not a good thing to have plentiful natural resources, but no way to get them to market. Alberta can improve these market opportunities by pursuing a more integrated grid with its provincial neighbours, while also making it cheaper to reduce emissions from the electricity it needs to power Alberta homes, businesses and industry. Nick Martin is a policy analyst at the Canada West Foundation and the author of Power without Borders: Moving towards an integrated Western grid.